Perma Hypercrete is a polymeric additive of cement for multi purpose use i.e water proofing of basements, toilets, sunken portion, roofs, swimming pool,water tank etc for surface protection repair, rehabilitation, floor topping, durable & aesthetic exterior finish with cement paint repairing of concrete and masonry, joining concrete to concrete etc. 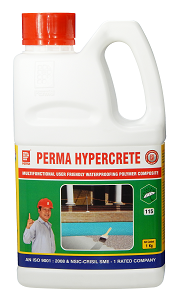 Perma Hypercrete combines water proofing with tough and hard-wearing surface. Develops excellent bond with most of the building materials.Is highly durable in continuous wet conditions. Is not affected by UV rays and by chemical ranging from mild acids to strong alkalies. Most properties of the coating improve with age. Bonding aid for the new and old concrete/mortar repair and patching of concrete. Packing : 500gm, 1kg, 5kg, 10kg, 20kg, 25kg, 100kg, 210 kg.